The number of poor people in China is huge, despite recent economic advances. The minorities in China constitute less than ten per cent of the entire population, yet they represent forty to fifty per cent of the absolute poor. This compelling book investigates the problem of poverty and inequality in and among Chinese ethnic minorities, focusing in particular on two important questions: Have the minorities shared the fruits of spectacular economic growth in China during the past two decades? Is their backwardness due to ethnic and cultural factors or to extremely low incomes? 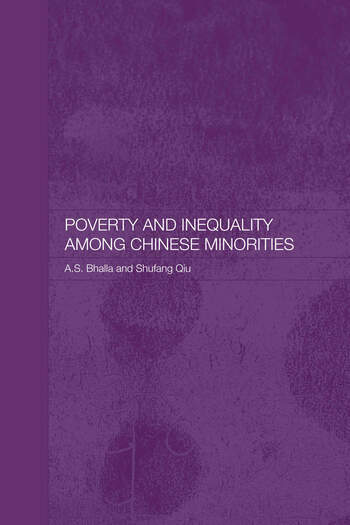 The authors examine the different factors explaining poverty, the relationship between poverty and ethnicity, poverty indicators that permit a comparison between minorities and non-minorities (or the Han majority), economic and demographic characteristics of minorities and their educational, occupational and gender profiles. They consider whether special measures in favour of minorities introduced by the Chinese government have contributed to an improvement in their standard of living. Poverty and Inequality among Chinese Minorities gives original research findings and new thinking on a highly topical issue in Chinese development economics, and fills a gap in the existing economic literature. A.S. Bhalla is a former Fellow of Sidney Sussex College, Cambridge, and former Special Adviser to the President of the International Development Research Centre (IDRC), Canada. He is co-author of Poverty and Exclusion in a Global World (1999, 2004; Japanese edition 2005) and The Employment Impact of China’s WTO Accession (2004); and author of Uneven Development in the Third World (1992, 1995). Shufang Qiu is an Economic and Business Consultant based in Cambridge, UK. He has worked for the Chinese government on economic reforms. His research interests include poverty alleviation, WTO and economic transition in China.